THE ICONIC ROYALTON HAS BEEN BRILLIANTLY REINVENTED BY ROMAN AND WILLIAMS/ REINSTATING ITS PLACE AS THE STYLISH LIVING ROOM OF MANHATTAN/ AND CROSSROADS FOR INTERNATIONAL TRAVELERS AND THE NEW YORK ELITE. SIMULTANEOUSLY SOPHISTICATED AND COMPLEX/ THIS NEW YORK MIDTOWN LUXURY BOUTIQUE HOTEL FEATURES A FLOOR-TO-CEILING HAND-FORGED CAST BRONZE FIREPLACE/ A TWENTY-FOOT SCREEN THAT WAS ONCE PART OF THE FACADE OF A BUILDING IN FRANCE AND HAND-UPHOLSTERED LEATHER WALLS REMINISCENT OF AFRICAN TRIBAL ART. DESIGNER CHARLOTTE MACAUX BRINGS A UNIQUE VISION TO THE CLASSIC MINIMALIST CHARM OF ROYALTON S GUESTROOMS AND SUITES/ RETAINING PHILIPPE STARCK S ORIGINAL BOLD FEATURES WHILE ACCOMMODATING THE NEEDS OF THE 21ST CENTURY JET-SET. ROYALTON S POPULAR FORTY FOUR BAR AND RESTAURANT REMAINS THE GATHERING PLACE AND POWER LUNCH SPOT FOR NEW YORK CITY S MEDIA/ PUBLISHING AND FASHION ELITE. LOCATED IN THE HEART OF MIDTOWN/ ROYALTON/ A 4-DIAMOND HOTEL/ IS JUST STEPS FROM GREAT SHOPPING/ BROADWAY/ THE THEATER DISTRICT/ TIMES SQUARE/ GRAND CENTRAL STATION/ EMPIRE STATE BUILDING/ BRYANT PARK AND ROCKEFELLER CENTER. DESIGNED BY ROMAN AND WILLIAMS/ THIS NEW YORK MIDTOWN LUXURY BOUTIQUE HOTELS ICONIC LOBBY FEATURES THE POPULAR FORTY FOUR BAR AND RESTAURANT. 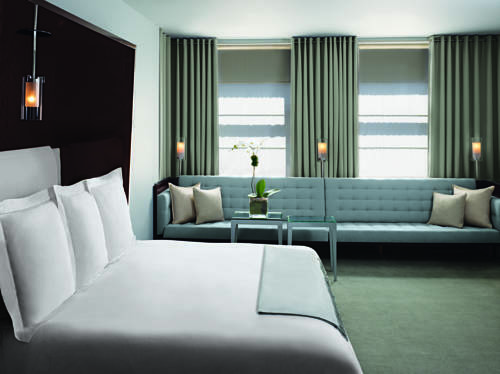 DESIGNER CHARLOTTE MACAUX BRINGS A UNIQUE VISION TO THE CLASSIC MINIMALIST CHARM OF ROYALTONS GUESTROOMS AND SUITES/ RETAINING PHILIPPE STARCKS ORIGINAL BOLD FEATURES WHILE ACCOMMODATING THE NEEDS OF THE 21ST CENTURY JET-SET. LOCATED IN MIDTOWN MANHATTAN. CONVENIENT TO TIMES SQUARE/THE THEATRE AND BUSINESS DISTRICTS. INSPIRED BY HEMINGWAYS FAVORITE BAR AT THE RITZ IN PARIS JUST 20 OF THOSE CURIOUS TO DISCOVER ITS WHERABOUTS CAN EXPERIENCE -LOBBY SOCIALIZING- AT ITS BEST. ROYALTON HOUSES -BRASSERIE FORTY-FOUR- CRITICALLY ACCLAIMED RESTAURANT AND FULL BAR SERVING BOLD CONTINENTAL CUISINE.